According to Live Science, the use of Dalmatians by fire departments began when firefighters would use horse-drawn wagons to get to the scene of a fire. When a fire alarm sounded, the Dalmatians would run out of the firehouse barking to let bystanders know they needed to get out of the way because the firefighters’ wagon was coming. At the Maugansville Goodwill Volunteer Fire Company, a Dalmatian named Sparky still helps the firefighters out today. Sparky teaches children of all ages about fire safety and prevention. “The kids light up when they see him. Sparky helps them realize that firefighters are friendly and will help out in an emergency,” said Phil Ridenour, president of the Fire Company. “We don’t want kids scared of the equipment a firefighter wears. It’s especially important to teach them this, so they know how to react in case of a fire.” The Fire Company received a grant from the Community Foundation to purchase the fire dog costume to better educate the community on fire safety. 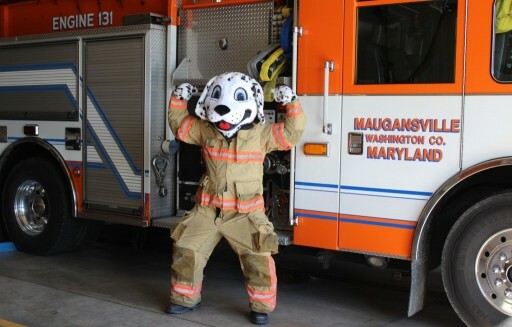 In the past few months, Sparky has visited many events, including YMCA Relay for Life, Washington County Ag Expo and Fair, Maugansville Pride Days, kids’ camps and schools. “Organizations learn about Sparky and ask us to come to their events,” said Phil. The Fire Company typically reaches more than 1,000 students each year. “Our goal is to get kids involved at an early age,” Phil continued. In addition to the safety program, the Fire Company offers a cadet program for ages 12-15 as well as a Fire Fighter 1 Class and EMT training. The Maugansville Goodwill Volunteer Fire Company was established in 1928 after a large fire in the village. It provides fire, rescue and Emergency Medical Services to approximately 22 square miles in Washington County, which includes about 10,000 people. However, many calls provide mutual-aid to Franklin County, Pennsylvania and Morgan and Jefferson counties in West Virginia. The Fire Company answers over 700 fire and EMS calls a year.